In time for Valentine's Day, New Zealand beer giant DB Export has rolled out a music video which turns drinking low-carb beer into a selfless act of love. 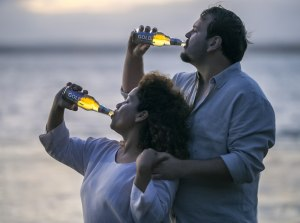 The near four-minute long music video features a Kiwi couple singing 'I'm Drinking it for you' as they count the different ways they love each other – including drinking a low-carb beer. In the video, the couple are seen preparing dinner before breaking out into song. They then continue singing to each other as they shower, work and play piano. The spot breaks the traditional mould of beer ads by recognising both men and women enjoying drinking equally. DB Export senior marketing manager Tony Wheeler said the Gold Extra Low Carb drink is the answer to the divided modern world. ColensoBBDO creatives Beth O’Brien and Thom Darlow said they sought to break stereotypes with the spot. “It’s great to see a beer brand give a one-handed salute to stereotypes, and speak to everyone equally,” the pair said. The music video was directed by Damien Shatford from The Sweetshop who said R&B was selected because it's known for romance and beers. In addition to the song, the campaign includes beer bouquets for couples to share. The song is available on iTunes and Spotify. However, it's not the only place fans can find it, with a remix of the song playing in gyms classes, live performances playing around the country, dedicated hours on radio and karaoke beer tasting available. DB previously spoke to AdNews about the challenges of marketing alcohol in New Zealand.